November came in here with cold temperatures. I was glad it stayed a bit warmer for the trick-or-treaters. I will try to be on the thread more this month. I am in the Team Challenges, but I don't expect to do very much scrapping this month. Happy Thursday and Happy November! Thanks Nylene for keeping us going. Not much going on here but that's ok. My dh had a great time at the game. Our team lost but maybe they will get it next year. I ordered some Christmas pp from Scrapbook dot com recently. It is the new Kaiser Craft collection. So I will be playing with it soon for cards. My art has been slow lately. I think my mojo is recharging. So maybe next week I can really get into my new drawing. This Saturday I am going to a craft fair at the library. I usually enjoy it. There was a craft fair a few weekends ago at a local church. I went and had a ball. They had a nice variety of crafters. I bought a heart bracelet and a few knitted items for my momma. So pretty! nylene- Hope your vision is clearing up. Hang in there. grammadee- Glad you had a super time and got back home safely. LisaDV- How are ya today? Your last post you said you had a headache. Hang in there too. elaynef- Hope you feel better. How is the home renovations and decorating going? Waving hi to you all and have a good evening! kellyr21, thanks for asking, headache has been a dull throb, nothing or more painful, but not nearly as painful as the first day. I think my trigger was lack of sleep and sugar intake. Usually when I'm running on no sleep, I binge on carbs and sugar to keep going. I guess my body says no more. I hope you have been recharged and can get back to your art. I'm glad Ron enjoyed the game. nylene, thanks for the thread. grammadee, glad you're home safe. elaynef, I hope you are feeling better. I'm still having problems accessing this post... the challenges are not even coming up for me now. woodysbetty best wishes with your packing...what a job! grammadee- still amazed at your stamina! lisadv- thanks for the get well wishes, I am much better. my dd told me to get some thieves essential oil and it really helped right away! kellyr21 thanks for asking about my redecorating. it is finished! I got my last thing, a lamp, Monday. We are very happy with everything. I know I keep promising pic and I will make good on that...dh has some that I will try to get from him later. Our decorator is going to come by next week to see the finished product. We did not do everything exactly as she suggested, but she kept telling us, "it's your house, you do what you like"
I'm still not back in the scrapping mode...I keep thinking about Thanksgiving and preparing for that. One of my dd and her family are coming and those grands are adults and all live far away. Its been a long time since they have been here. We usually go to them. Here is one pic from our trip with the youngest grands to Geronimo Creek. I'm still amazed that we had this one beautiful afternoon of hot, sunny weather for the boys to play in the creek. It should have been too cold and rainy...I know the boys will never forget this. Rope swings, canoes, paddle boards, kayaks....they had never done most of that before, but you would have never known it. Even though it was raining and flooding, we did get to have adventures every day. Dh really enjoyed taking them to the wildlife park near San Antonio and I really enjoyed the hike a Palmetto state park...it was so green and beautiful. There also was a game room with pool, ping pong, etc that they loved. Happy November, everyone! After early winter like weather, we have had a lovely couple of weeks of warm fall weather, but it is beginning to feel like winter now, which is typical for this time of year. We had a bit of snow yesterday, but it melted before it had a chance to build up. The weather man promises us snow for this weekend. Which challenges are you looking for, elaynef? When you close out of the Pokey Peas thread, you should be in the challenges sub board. This board and the Stamping/cardmaking board are above the pinned threads on the main Scrapbooking board. I moved the pinned challenges link into the challenges board to keep all the challenges together. So glad you had such a great vacation with the dgk's. That photo looks idyllic. It is so much fun to see the kids having a good time. nylene I would not be surprised if you took a bit of a break from scrapping this month: you were a scrapping MACHINE in October. Don't know how you accomplished so much while doing all that driving to appointments, and feeling all that stress. Hope you find your mojo soon, kellyr21. I am looking forward to seeing your art and your Christmas cards. I have missed one of my favorite craft sales already and will miss the next one, but I am booked to take a Seniors' bus tour to a large one mid month. Looking forward to that. How is that baby, justlisa7? Is everyone healthy now? I managed to escape with nothing more than fatigue and a cold sore from my week with sickies. Hope your headache is on its way out, LisaDV. I often feel after a migraine as if I have a muscle stiffness in my brain. Hard to explain. But be kind to yourself, get some rest, and hopefully you will be "right as rain" soon. I had started a post yesterday and my computer decided to restart and install updates. I lost what I had written and never made it back online. I thought I would share my new kittens, Sophia and Lola. I am on vacation from work for a couple of weeks. In less than a week, I will be at a 4-day weekend crop with a girlfriend. I need to start planning what I am going to work on. Tonight is the art walk and I hope to attend. It has been cold and rainy but it appears the sun is out. I am afraid the temps are going to be cooler tonight. I am looking forward to some of the exhibits. I am currently watching Netflix, "The Haunting of Hill House". I love scary shows/movies and this is scary!! I hope everyone has a Happy November! Hi everyone. Good luck finishing your album grammadee and safe travels. I hope we can have a card making date after you get back from your trip. Really cute kittens knutschen. Have fun at your crop. That sounds like a great time elaynef. That picture looks so nice. I am envious of the sunshine. I love Kaiser Craft kellyr21. I'm just not allowing myself to buy anything for a couple months at least. I have so much Christmas paper already. nylene I loved seeing all your pages in October. If I get a chance I will leave some love in the gallery. I scrapped a lot in October. My November is going to be much slower. I signed up for a restorative chakra yoga class. It is once a week for 7 weeks and each week we learn about one of the body's chakra's and do some poses associated with that part of the body. It is much more relaxing than my usual class. In fact, my Fitbit often thinks I'm asleep for 70 minutes out of the 90 minute class! I'm looking forward to a quiet weekend. I might tidy my scraproom a bit. It is a disaster after Layout a Day in October. Have a great weekend everyone! November is a busy month but I did not sign up for challenges he’s because it keeps me creating a little. need to make Christmas cards for here, Christmas tags for some presents and work on stuff. Plus, I need to scrapbook the baby still. The three boys are feeling better - I cough a bit at night and think it is maninly allergie. So warm here in Florida still but it is starting to get a little cooler. nylene - glad you were feeling better to scrapbook so much last month. 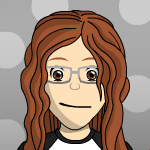 kellyr21 - hope you enjoy your craft fair and enjoy making the new Kaisercraft line when it comes in. justjac - enjoy your new yogis class! msliz - how’s the card making going? I am going to make your card first to get it out on time. grammadee - Glad you did not get too sick. Enjoy finishing your Florida album. elaynef - sounds like a fun time! Glad you had one sunny day - great picture on the lake! knutschen - super cute kitties!! Have fun at the weekend crop when you go! I miss going to those! LisaDV - glad you are feeling better! headaches are the worst! joyfulnana - Have a happy november!! I've been busy cleaning carpets this weekend. yucky, but necessary and they look so nice when I'm done! Got a bit of scrapping in this morning and now that the carpets are done I'm going to take a rest and go back to scrapping. kellyr21 that's so cool that your DH got to go to the game, I'm sorry they lost. I can't wait to see your painting once it's done. justjac, I think Chakra yoga would be awesome. I have a DVD of yoga for the chakras that I pull out once in a blue moon. That one and a kudalini DVD that I need to try again. I really love yoga but resist doing it for some reason. You mentioned LOAD, and I've always been interested in doing that as well, but I take forever to start and finish a page so I'm not sure how I would do lol. @knutsen your new kittens are adorable! Have fun at your crop! I've never done one for more than a day/evening. Four days sounds wonderful! I do not like scary movies or shows so I'm sure I won't be watching that! Although I did watch the first season of American Horror but then the second one was too scary so I never watched again lol. I just can't do the gore. Even they don't show it, I just can't watch that stuff. Which is odd. My favorite novels are serial killer suspense and if there isn't a dead body in the first chapter I'm bored lol. grammadee I hope you are able to finish your Florida album. I know that feeling of "get it done" I get that way often. I thought the time change was next weekend, so I was pleasantly surprised to find out it was yesterday. It's my favorite day! Falling back and I really feel like I got an extra hour in the day. elaynef what a fun time and wonderful memories made with the grands! It looks wonderful! nylene, justlisa7, LisaDV, woodysbetty and msliz hope you are having a good weekend! I need to go card shopping soon. I got the wild idea to try and make my card, but who was I kidding?? I've never made a card in my life, and I don't think this would be a good time to try. I will be puttering with in next year so that maybe I will send handmade cards next year! elaynef , glad you're better. That photo is awesome! It sounds like you all had a wonderful time. grammadee , enjoy your next trip and safe travels. knutschen , Sophia and Lola are adorable! Have fun at your retreat! justjac , I hope you do get some rest/relaxation in November. Are you going to be part of any plays this fall/winter? justlisa7 , I'm loving seeing your baby photos on IG. What a beautiful family you have! joyfulnana , I hope you do give card making a try. Last week we had some bad news. My dh's uncle (his dad's brother), who even I call uncle which is not how I am so that tells you how special he is, went into the hospital on Wednesday. By Thursday they had started his end of life plan. Don spent Friday there at the hospital and came home very late that night. Now it's just a matter of waiting. So we expect a funeral to happen this week. I took the kids Friday for funeral clothes. With this, hunting season, Thanksgiving, we've decided to put aside house hunting until at least December, maybe until January. I can use the extra time. My kitchen faucet went out as well. It started leaking. My plumber is trying to work me in today. I've been turning the water valves off underneath the sink except when I'm doing dishes, but yesterday it went from a slow trickle from the faucet and base to small stream at the faucet and gush at the base. I figure it'll just stay off until he can get it fixed. I've been working on tagging my digital kits to make digital scrapbooking easier. I've decided to do most of 2018 digitally instead of traditionally. I've decided to try to tag 2 kits a day, it should only take a few years to finish. I hope everyone else has a wonderful week. My PSA for today: Don't forget to tell your peeps, you love them. Oh LisaDV I'm sorry about your DH's uncle. You sure do have an awful lot going on now. I hope things settle down soon for you. ((((Hugs)))) to you and your family for the loss of your uncle, LisaDV. Hope you got the kitchen faucet fixed. Not what you want to go wrong in a busy month like this. Hope all is well with you and your dh, nylene. Are you still crafting this month, or are you having a well deserved rest? You were a powerhouse in October! Cleaning carpets does not sound like fun, joyfulnana. But it must feel good now that the job is done. Hope you decide to start card making. It is a wonderful way to use up scraps from your pages. And a wonderful excuse to purchase new playthings just for cards ! justjac and my niece and I are planning a card making day in a couple of weeks. Hope to put together some kits we picked up at the crop, use some of my Christmas dies, but also to just go freestyle. Lots of inspiration in the CARDtober threads. Glad you and the boys are starting to feel better, justlisa7. If you are looking for cool weather you should take a trip up north! It is like Old Man Winter was checking the calendar and as soon as the page turned to November the temps slammed to below freezing, and the snow started falling. At least we had a decent October for farmers to take off their crops. Those cats are cute, knutschen. One looks identical to a mother cat we used to have on the farm. Her name was Spice, and she LOVED attention. Hope your crop is fun. Hope you can share some of the things you create there. kellyr21 do you ever sell your creations at craft fairs? I bet your cards based on reproductions of your artwork would sell like hotcakes. Waving hello to msliz, patin, elaynef, and anyone else I have missed. I have been working away on my Disney/Florida album. Just two more pages to complete, and to do them I need some photos printed. Hope to do the printing tomorrow on my way to the airport. Will also pick up a couple of pages of mine at the LSS. They were part of the album, but were chosen for a prize at the crop and as I left early, the LSS lady kept them for me. I have the supplies and tools for the last two pages ready to pack in my suitcase. Hope to finish them while I am away and then when I get home all I need to do is take the binder into the printer to create the books for the kids' families for Christmas. Heading off to BC to do a bit of grandparenting this weekend while ds and ddil are off to Vegas. Flight is Wednesday afternoon. Today I am doing laundry and sorting clothes and getting organized. This evening dh and I have a card playing date with friends. Hi pokeys! Happy November...we have been in whirlwind packing purging and interviewing realtors. I found it really disturbing to have people walking thru my home asking questions, looking and commenting even though the comments were mostly positive. One realtor walked in my scrap space and said Oh you one of those people who actually use their craft supplies...I didn't correct her!! LOL! We chose one and we are set up to have the house pictures done and officially list the house, which meant I had to have the "I'm retiring and moving" conversations with my clients and my students at the yoga studio...that has been really hard. Just thought I would quickly pop in and say how grateful I am that the Peas will go with me!! LisaDV i am so sorry to hear of your loss and nylene I hope your eyes are better!! Waving and sending a cyber hug to all the pokeys! grammadee even though you don't live near your grands, it's great you have so many opportunities to spend time with them! woodysbetty good luck with getting your house sold quickly and I had to lol @ what your realtor said! I'm not sure what impression people would have about my craft usage. I only know there is an awful lot in there that hasn't been touched yet! I thought and thought about getting the supplies to make my Christmas cards, but I know I would end up not using it until next year and I'm trying to avoid buying things for too far in the future. I know me, I wouldn't be happy with any of the cards and, would end up in a time crunch and end up sending store bought, so I will keep to that plan for now lol. You all will be much happier with that result I'm sure! Buying for later is also part of why I'm in the freezer until Spring as well. I want to actually break open some of this stuff I bought the last few months! lol. I had every intention of scrapping last night, but I'm just extra tired this week and ended up on the sofa falling asleep watching a movie instead. Now that the carpets are done maybe I can finish the 2 layouts I have this weekend and get them posted. Fingers crossed. Sorry for this long post....that's what happens when you stay away for a week! 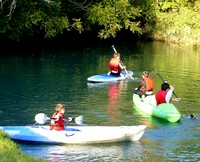 elaynef, your photo of the grands canoeing looks like such a wonderful, leisure day. I’m sure they enjoyed trying all the things they had not done before. Glad the redecorating is just about finished. We need photos. Are you feeling better? knutschen, your kitties are so cute. I’m sure you are enjoying them. Was your Crop last weekend or is it still coming? I hope you get/got a lot accomplished. justjac, I had to laugh about your scraproom being a disaster after LOAD. I am right there with you! You deserve to take a bit of a break after that many layouts! justlisa7, are you feeling better? I hope the boys are all on the mend, especially the baby. I considered not signing up for the Team challenges this month, but like you, I decided it does keep me scrapping. msliz, how are the driving lessons going? I finished your Hanukkah card yesterday. I will sent it off next week. Do you have big Thanksgiving plans with family? joyfulnana, thank you for the reminder that I need to schedule a carpet cleaner. I also like to have my windows washed before Thanksgiving. I will no longer climb a ladder or allow DH to climb, so I hire it done. Do you have family coming for Thanksgiving? I totally understand about making cards. I never made cards until 10 years ago when a friend started our Card Club. We certainly don’t want to put pressure on you at a busy time. Store bought is great. LisaDV, I am so sorry for the loss of your Uncle. Hugs to you and your family. Did you get your faucet fixed? Those are the kinds of things that always went out my me when DH was gone with the National Guard. I am still praying the for perfect house to come on the market just as you need it. grammadee, I can’t believe how fast you scrap. You have really worked to get the Florida album finished. I hope everything goes well with the printing of it. I think you are the Energizer Bunny. 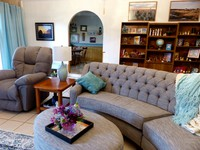 Your kids and grandkids are so blessed to have you available for tending/visiting! 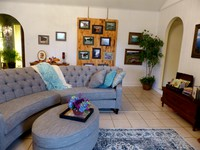 woodysbetty, I giggled at the Realtor comment about your scraproom. I love it. Best wishes for having the sale go well. I am so glad you can take all of us along with you to Florida! kellyr21, my artist friend came to my scraproom yesterday and saw your picture. Her quote was, “I love that print, who is the artist?” I was so proud to tell her about you. I look forward to seeing more of your painting. patin, waving to you and hoping all is going well. I have been helping my friend make 100 interactive cards for 3 Mexican Orphanages. She often commits herself to huge projects! I spent two full days just cutting pieces for the twist pop card. Others have been putting them together. I have also been cutting pieces for my Christmas cards and will post them when they are totally finished. That may be the only scrapping I do this month. Happy Thursday Peas! Hope you are all doing well these days. Last Saturday, my dh and I went to our library's craft sale. They told me about the raffle and I was like ok maybe. After I walked around some, I was gonna get a ticket on my way out. When I did, I really saw how they had 29 prize packages and each one was loaded with several gits. So they had 29 bags and you had to put your ticket in the bag for the drawing. I had to buy more tix and had my dh get us more. LOL! We had seven all together. So after waiting to see if we won # 29, WE DID! It included a $50 Cheesecake Factory card, $40 for a local Italian restaurant and a full day admission to our local golf course with cart for two. We were so surprised and excited. We don't even golf but I will definitely be out there having fun. I found out about this craft group at this local church. I went last week and am trying it out again tonight. They make things to sell periodically as fund raisers for the church. So not sure how often I will go but it was nice to finally find some crafters in my hood. nylene - Oh how sweet! I am so glad your friend liked my art. I like it too. LOL! Glad you are helping your friend with the cards. What a big project. But she go the right gal to help her. woodysbetty - It's official now! Florida here you come. Yes, we will be with you as you go through this process. 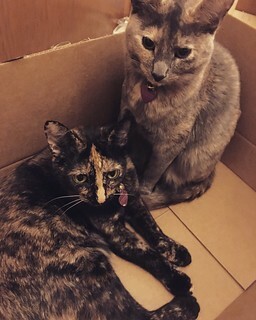 @knutchen- What cute kittens you have. elaynef - Oh so happy to hear your renovations and decorating is all done. I know you must felt so much relief. I still have a few things to do here in my place. My kitchen table area is still not what I want but I am not sure what I want. LOL! It is a small table in my nook and maybe it has too much stuff on it. grammadee - Have a nice trip! LisaDV - Sorry about your loss. Always tough! Waving hi to you all! kellyr21 that is so awesome that you won the bag you wanted! And great stuff too! And finding a group of crafters! I need to find something like that, but my work hours really put a crimp in any kind of social life on the weekdays. I work 10-7. I love not getting up to an alarm anymore, but it makes it hard to do anything after work as well. nylene, I'm taking the easy way out for Thanksgiving dinner and ordering from Bob Evans and having the boys here. I usually cook a traditional Thanksgiving dinner, but decided this year it sounded like too much. I always intend to make a small dinner and it ends up huge with too many leftovers lol. Boy, in the heat of summer I say I want to live somewhere cold, well it's cold now! Down to 18 or 19 tonight overnight and I'm missing Fall! And of course I want to run by HL tomorrow and do some shopping for cards. Chili is on the menu for this weekend! I hope everyone has a great weekend! I need to get to the gallery and leave some love! LisaDV - I am so very sorry about your uncle. It’s so hot here in Florida grammadee, I wish I was up North. I miss snow so much and changing leaves. nylene - so cool to be making cards for an awesome cause!! 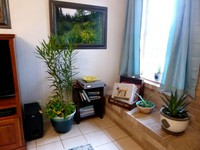 I finally took some pictures of my restored, redecorated den to show you all. I was waiting for dh to give me his, but that didn't seem to be working. The last one was the hardest with the plants and the fireplace sitting area. I think it took us a month to finally get something that we kind of liked. I know that traditionally we would put a chair there. We used to have one and NO ONE ever sat in it, so we wanted to do something different and we wanted the picture there. Also we have never been able to keep plants in this room because it is so dark. Now that it's white, it seems to be lighter. We'll see. I'll try to get some more but will have to post another reply for more pics. Feel free to give suggestions, I love them.. got a lot from friends and family while we were working on it. Part 2: If you can see my nativities in the bookcase and are wondering why I decorated so early for Christmas, I just did those...nothing else. Some of my family are coming for thanksgiving, and I wanted to show them, plus I did not want to do that bookcase 2x. It takes me about 3 days when I redo it. The cedar chest was made by dh grandfather. Probably around 1890. 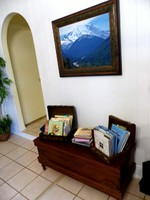 It holds a lot of scrapbooks, which I love, because I didn't like the way they were stored before. All the photography is by dh or me. Mostly him. I like to do people and he likes landscape. Happy Monday. Ds and ddil are home safe, my bags are packed, and I will be flying home on Tuesday. Hope to print photos after I land. Lots of hockey pics, some fun baking ones, too, plus some of the girls clowning around. My dgd texted me some photos she and her friends took on a day trip to Victoia. At least I don’t think I have to go in to work on Wednesday. My former employer had called in a panic b/c they needed someone to fill in for someone with an ill child, but it sounds like they have this week under control. Thanks for sharing your “new” room elaynef. It looks really welcoming. Enjoy having your dd and family, justlisa7. Family busy is the best kind. Hope your home sells soon, woodysbetty. I always hated having someone going through my home. It was better when the realtor did it and I didn’t have to listen to the comments. Good planning to cut down your work for Thanksgiving, joyfulnana. Hope you enjoy the stress free holiday. Okay, off to sleep now. See you on the flip side! Hello! So after typing my last post, an hour later, I received the call he passed. I knew it was coming, but was still kind of hoping he'd surprise everyone. So we are back from the funeral and some family time, and completely exhausted. Thanks for the love. My kitchen faucet did not get fixed before we left as a restaurant had an emergency which put his job that he was going to do before me in my time slot. So I just tried with ds's help to replace it. Unfortunately I don't know where DH put his large crescent wrenches. He's not very organized. So DS went to look and couldn't find them either. boo! So I called the plumber again to see if he can work me in. Hoping today! Don will be home tomorrow evening and will do it then. But without water to wash the dishes or the vegetables, I'm at a loss for cooking anything. Unless I transfer water from the bathroom to do them, which I've been avoiding. We came home to snow! A good 3" on my van which was left home. Then this morning my escape had at least 3-4" on it. I wished I would have cleaned off the van last night. woodysbetty, those client conversations must be tough. It is the good thing about 2peasrefugees. I wish you lots of luck and a quick sale. joyfulnana, I will probably buy cards this year too. justlisa7, enjoy the time with your dd. nylene, your are a true friend to help out with the card making. I'm sure they will be a big hit. kellyr21, that was some prize package! Congrats! I hope you enjoy your new crafting group. elaynef, wow! that's a huge difference! So gorgeous! I bet you just love being in there now. grammadee, hope you are having a safe flight home. OK, off to get something finished today. Happy Tuesday! Hope you all are having a nice day. We had a good weekend especially with my dh having yesterday off. The fires out here are crazy. Thankfully, it isn't in my area but on Saturday, the smoke was thick in the air. I was gonna take a walk but had to wait until the air was better. Hopefully, they can stop these fires any day now. The craft group I visited last Thursday was fine. They are gonna be having a holiday sale and making things for it. I helped with a table centerpiece and hope to finish it next time. Just a small group of ladies and they are called the "Busy Bees." So cute! elaynef- What a bright and pretty den area. I love the light blue accents like the curtains and the throw blanket. Also, I like the wall of picture frames. The couch is so pretty. Great job and I know hope you enjoy relaxing there. grammadee - Have a nice trip home. Those grans really keep you happy busy. joyfulnana - I know what you mean about the weather. When it is hot out here I look forward to the cooler Fall. But the temps you all have now is too cold for me. Sending your some of our warmth. LisaDV - SNOW??? OMG! I hope you are warm and toasty. Is your sink ok now? I hope it wall works out. House hunting, new job, moving, holidays, plumbing stuff and family death, it's a lot. Hang in there Lisa! Us Peas are cheering for you. kellyr21 , I had turned the heat down to 60 and put it on hold when we left. When we came back I put it up to 72 to get it warm and forgot about it until last night. We've definitely been warm. I'm so glad that you enjoyed your time with the "busy bees", that is a cute name. I guess my plumber is busy as I haven't heard from him which isn't like him at all. Don's going to stop and buy a basin wrench on the way home, which I saw on YouTube and would make taking the nut off that holds the facet so much easier since there is no space there to work. Gotta love YouTube. I'm fairly confident I could have gotten it with a large crescent wrench, but Don gathers his stuff for a job and doesn't really have a it goes back here kind of mentality. Although he is now trained if he takes something from my craft room he puts it back exactly where he got it. So I will take that as a victory. I had to switch to Tapatalk as I created 2 layouts in my hotel down time that I thought I’d share. Good Wednesday morning Pokeys. I am home safe, and have enjoyed a wonderful sleep in my own bed. Enjoying reading about all your adventures. The Busy Bees sounds like a group right up your alley, kellyr21. Will you be going back on a regular basis? Hoping the fires are under control soon. Very scary for everyone there, and the smoke itself can cause lots of health problems. I have a nephew in San Diego with a brand new baby. Am thinking of them a lot lately. Sounds like the adventures never end for you LisaDV. Hope you get your faucet fixed. Dh had some plumbing issues while I was away, and we may have the plumber here today. I guess the hot water tank thermostat was not shutting off heat when the water reached temp, so he now has that on manual. Problem is, the furnace and the water tank are on the same manual switch. Good thing we have lots of sweaters and blankets. I hope to put together my November calendar page this morning. Have the photos printed. Found a sketch I want to use. Need to cut the title with my Silhouette and I am good to go. kellyr21, I think the Busy Bees sounds like a fun group for you. Where do they meet? I look forward to seeing some of the things you are doing. I have been concerned for you around all the fires in your area. I'm sure the smoke is terrible. Our big fire in Utah a few months ago was sending burned debris into our daughter's yard. Fire is so deadly. joyfulnana, your cold temperatures sound like ours. It warms up in the day, but it's cold and windy at night. I understand about having too many leftovers after a big meal. I have started packaging up left overs and sending them home with the kids. With just 2 of us, they would last forever! I hope what you order tastes great! elaynef, your room looks so restful and beautiful. 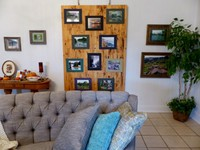 I love all your photos on the walls and your scrapbooks out where they can be enjoyed. I'd love to see a close up of your nativities if you get a moment. I'm sure you are enjoying the peace and quiet and lovely room. Are you feeling better? LisaDV, I love seeing your layouts. I have never heard of waterbread. I can't quite read the journaling. Can you explain? Is that a new dog? I love those angled border pieces. I hope the scrapping has relieved some stress. Good luck with the faucet. I hope you hear from the plumber soon. justlisa7, I hope you have a great time with your DD. I really miss having DD and family around. It's hectic when they come because nothing gets done, but visiting time is more important than chores anyway! Enjoy them and scrap later. grammadee, I am glad you are home and can sleep in your own bed. It sounds like you had a good visit, but it's always so nice to come home. I'm sure your DH was happy to see you! msliz, your card will go out with my mail today. You should get it in plenty of time. It was fun researching to know what would be appropriate. I hope I didn't run any red lights. The thought is sincere. Waving to all of our other busy Pokeys. I know how busy this time of year is. Take care of yourselves. I hope to get photos of my cards and get them posted today. We have Card Club tonight which is always an uplift. DH brought in some beautiful checkerboard wooden pens he made yesterday. That's tiny little dark and light blocks glued together and they turned out so nice. I am so grateful that he can still see enough to do that fine work. He is blessed with close vision in the small amt of peripheral vision he has left. Hugs to everyone! Have a great week.